8 ounces of pickling spice for canning pickles, okra, or any other canning item you like. Ground to perfection. 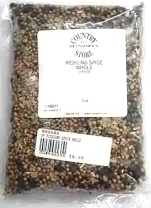 1 lb of pickling spice for canning pickles, okra, or any other canning item you like. 5.5 ounces of Pickle Crisp Granules for canning pickles. 3.5 ounces of Bread & Butter Pickle Mix for canning pickles. 1.8 ounces of Mixed Pickling Spice for canning pickles. Better tasting, fresh salsa is simple to make with Fiesta Salsa Mix. Simply add fresh, vine-ripened or canned tomatoes, and mix with a splash of vinegar for perfect salsa every time. Small batch size: Makes about 2 16-oz. pint jars. 1.3oz package. 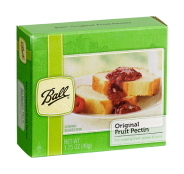 For making fresh jellies and jams. 1.75oz package.